Our legal system is based on the principle that an independent, fair, and competent judiciary will interpret and apply the laws that govern the people. The role of the judiciary is central to American concepts of justice and the rule of law. Intrinsic to this code are the precepts that judges, individually and collectively, must respect and honor the judicial office as a public trust and strive to enhance and maintain confidence in our legal system. The judge is an arbiter of facts and law for the resolution of disputes and a highly visible member of government under the rule of law. Public confidence in the judiciary is eroded when there is an appearance of improper process by those have been sworn to carry out legal duties for the people. The El Dorado County Placerville Courthouse project has been riddled with shady deals for years. Someone asked the Court system to investigate this issue and we heard that the Court stated that they investigated and saw no issue. The overarching purpose in preparing an Environmental Impact Report is to provide the public and the decision-makers with detailed information about a project’s environmental effects, ways to minimize the project’s significant environmental effects, and reasonable alternatives to the project. Under the California Environmental Quality Act (CEQA), an EIR must be prepared whenever there is substantial evidence, in light of the whole record, that a project may have a significant effect on the environment. As required by CEQA, the EIR evaluates a reasonable range of alternatives to the proposed project. Alternatives analyzed in the EIR include the No Project Alternative as required by CEQA, as well as a Reduced Size Alternative. According to the study, impact 3.5-6 for the proposed project could contribute to cumulative losses of archaeological or paleontological resources. Under CEQA, the No Project Alternative must consider the effects of forgoing the project. The No Project/No Development Alternative describes the environmental conditions that exist at the time that the environmental analysis commences (CEQA Guidelines, section 15126.6 (e)(2)). In the case of the proposed project, the project site is currently a vacant site adjacent to the operational El Dorado County Jail. Existing conditions are described in the Environmental Settings of each section within Chapter 3 of this Draft EIR. The alternatives analysis must also describe conditions that could reasonably be expected to occur if the project is not approved. In Executive Summary Judicial Council – New Placerville Courthouse ES-4 ESA / 208091.04 Draft Environmental Impact Report October 2014 this case, it is reasonable to assume that, if the proposed project is not approved, the proposed project site would remain vacant and courthouse operations would continue to be separated by the continued use of both the existing Main Street Courthouse and Building C.
Under the No Project Alternative, the Judicial Council would not approve any project, and none of the mitigation measures identified within this Draft EIR would be implemented. Land transfers described in Chapter 2, Project Description would not occur. A new roadway from Forni Road to the proposed project site would not occur. The conveyance of the existing Main Street Courthouse from the Judicial Council to the City of Placerville or El Dorado County would not occur. Under the Reduced Size Alternative, the Judicial Council would construct a new courthouse at the proposed project site that would replace courthouse functions at Building C. Construction of a new courthouse on the same site as the proposed project would include the provision of two courtrooms and administrative support services. Current courtroom functions at the Main Street Courthouse (four courtrooms) would remain in use. The courthouse constructed under the Reduced Size Alternative would be substantially smaller than the proposed project because four fewer courtrooms would be constructed. A new access road would be required, similar to the proposed project. However, the amount of surface parking area would be less than under the proposed project because fewer employees would work at and fewer people would visit the new courthouse compared to the proposed project. The land transfer described in Chapter 2, Project Description, would not occur. Instead, the Judicial Council would purchase the courthouse property from El Dorado County. The Judicial Council would vacate its office space in Building C, but would retain use and control of the Main Street Courthouse. An EIR is required to identify the environmentally superior alternative from among the range of reasonable alternatives that are evaluated. Section 15126.6 (e)(2) of the State CEQA Guidelines requires that an environmentally superior alternative be designated and states that if the environmentally superior alternative is the No Project alternative, the EIR shall also identify an environmentally superior alternative among the other alternatives. For each environmental topic analyzed in the EIR, Table 4-1 indicates whether the impacts of the project alternatives are more or less severe than those of the proposed project. From the alternatives evaluated in this EIR, the environmentally superior alternative would be Alternative 1 – the No Project Alternative. This alternative would avoid all significant impacts associated with the proposed project. 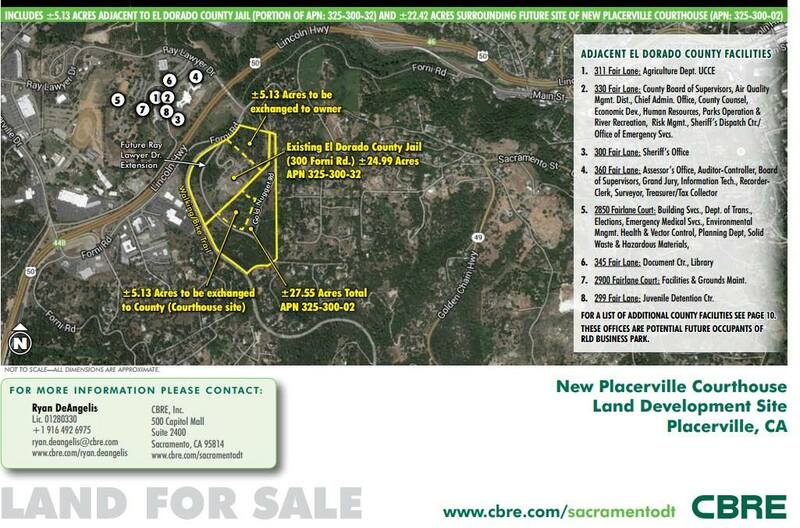 In accordance with the CEQA Guidelines, if the No Project Alternative is identified as the environmentally superior alternation, an environmentally superior alternative must then beExecutive Summary Judicial Council – New Placerville Courthouse ES-5 ESA / 208091.04 Draft Environmental Impact Report October 2014 selected from the remaining alternatives. Due to the factors described above, Alternative 2 – the Reduced Size Alternative would be the environmentally superior alternative. The Governments of El Dorado County and the City of Placerville have been involved in this project, along with the Briggs family for many years. For the public that has some knowledge of this issue they have pleaded to retain the function of the Courthouse in our Historic Courthouse in Placerville on Main Street. The few aware of this action have been mostly ignored by those in office, moving forward as if this is a done deal. We have tried to make comments at the appropriate opportunities along the way, but the information regarding this project has not been forth coming. Several of the members of the public attended a meeting in April of 2012. I would be interested to find the comments from that meeting. In regards to the October 2014 Draft EIR that came out for this project, someone by chance came across this document at the Placerville library. Luckily this person brought it to the attention of those of us that have been concerned regarding the future of our Historic Courthouse in Placerville. If this person had not come across this document the public would not have even known it had been published. As far as we have researched, we have not found anywhere where the County or City posted the release of this document. Also due to the late date in which we became aware of the Draft EIR we missed the 11-6-14 public meeting. Those involved in the City and the County have a history of being adversary towards the wishes of the public that they serve. Knowing this we have lobbied the State the best that we have been able given limited resources. Since the time that the responsibility of the Court facilities has transferred to the State, the County and the City have lobbied the State for a new Courthouse by the County Jail. (See exhibits 1, 2 & 3). We have more exhibits regarding this, but due to the constraint of time we will send if requested. The City of Placerville has been involved in other projects that has been tainted in controversy. They attempted to impose Redevelopment on the City residents so the residents won a referendum against that project. Next the City approved a roundabout that was highly contested by the business owners surrounding the project. Friends of Historic Hangtown (FOHH) was formed and sued the City on the roundabout project after the City approved the project despite enormous opposition. FOHH won the case since the City did not do an adequate report and study on the project. After the lawsuit the City proceeded to move forward with the project by funding a new EIR. Given the disregard that the City acts in regards to the public sentiment, FOHH was able to get a Measure passed (Measure K) that would require the City to go to the public for a vote for any Roundabout within the City limits. The City’s recent response to this is to ignore Measure K and move forward with future roundabouts in order to facilitate the project at Ray Lawyer Drive that is required for the future Courthouse. The City thinks that Caltrans will assist them if they are challenged by a lawsuit. “Cleve Morris (Placerville City Manager: As far as telling you what is going to happen with those (WPI) roundabouts designed as part of the Interchange, we’re moving forward with them at this point. Will we get challenged on them? We don’t know. But we are also coordinating with Caltrans in that process, and will continue to coordinate with Caltrans to make sure that they are on board. We’ve already had discussions with their legal counsel regarding that, so we will make sure that’s . . . But I can’t tell you, if you’re asking “How Measure K will affect those?” I don’t . . . by the next meeting we will not have that answer. Carol Patton (City Council Woman): Has Caltrans made a ruling on the Measure K impacts to the Western Placerville Interchange? The County and the City formed a 2 by 2 Committee that consists of two Board of Supervisors and two City Council Members that do not have to abide by the Brown Act in which they can make decisions outside of the purview of the public. Item #9. 12-1543 Chief Administrative Office and City/County Two by Two Committee recommending the Board adopt Resolution 186-2012directing County staff to work with City of Placerville staff to identify areas of cooperation which will result in more efficient services. Resolution 186-2012 was adopted upon approval of the consent calendar. John Briggs, owner of the property surrounding the Courthouse project has lobbied the State, County and City for decades for this project. He plans to develop the land around the Courthouse as a legal center and lease out space for the District Attorney along with other judicial offices. Many felt that John Briggs funded his son’s campaign in order to facilitate favoritism for projects including the Courthouse. Ron Briggs served as County Supervisor for 8 years. Brian Briggs, Ron Brigg’s son was put on the City’s Planning Commission. The County swapped the land with the Briggs on the December 2, 2014. Ron Briggs did recues himself, even though as he walked off the bench he stated that he really did not need to. The Brigg’s property and swap was advertised as a done deal prior to the vote to swap the land. (Exhibit 4) According to the Draft EIR for the Courthouse, if the state were to choose Alternative 2 it would not be necessary to swap the land. Past Supervisor Jack Sweeney’s overreaching involvement with County facilities. Past Supervisor Jack Sweeney’s involvement in the Ray Lawyer Drive Interchange, even though he was advised by the Fair Political Board to recues himself from votes involving this project (FPPC #A-89-639). Supervisor Brian Veerkamp’s brother, contractor Doug Veerkamp, was awarded the contract from the City prior to Brian taking office to expand the Ray Lawyer Drive Interchange. The County ended up assisting with the cost. The County changed their procedure for processing applications for road projects. They assigned Kim Kerr the ability to go after grants and award them to contractors without going back to the Board of Supervisors. Doug Veerkamp appears to be working on the many road projects in the County. According to the CEQA process, following the public review period, written responses will be prepared to all comments received on the Draft EIR. Those written responses, and any other necessary changes to the EIR, will be submitted to the Judicial Council for their consideration, along with the Draft EIR, as part of the certification action on this EIR. The Judicial Council will also consider adoption of Findings of Fact pertaining to this EIR, specific mitigation measures, a Statement of Overriding Considerations, and a Mitigation Monitoring and Reporting Plan. The proposed project would include a number of actions, as outlined below. Off-site improvements would include an extension of Ray Lawyer Drive from the new off ramp interchange (scheduled to be completed in 2016/2017) to the courthouse driveway, and an extension of the on-site sewer and water lines. In accordance with California case law, if the Department is presented with a fair argument that a project may have a significant effect on the environment, it shall prepare an EIR even though it may also be presented with other substantial evidence that the project will not have a significant effect. One of the primary issues to consider when preparing an EIR is the nature and number of project alternatives to be included in the environmental document and technical studies. The CEQA Guidelines state that an EIR must describe a range of reasonable alternatives to the project, or to the location of the project, which would feasibly attain most of the basic objectives of the project but would avoid or substantially lessen any of the significant effects of the project. The courts have stated that an EIR need not consider every conceivable alternative to a project, but rather the determination of the range of alternatives should be governed by the rule of reason. The rule of reason requires the EIR to set forth only those alternatives necessary to permit a reasoned choice. The alternatives must be limited to ones that would avoid or substantially lessen any of the significant effects of the project. Of those alternatives, the EIR need examine in detail only the ones that could feasibly attain most of the basic objectives of the project. The range of feasible alternatives must be selected and discussed in a manner to foster meaningful public participation and informed decision-making. The study performed for this EIR has given the public feasible alternatives. We have shared these alternatives with the public. Wendy Thomas, Councilwoman for the City of Placerville is publicly stating that misinformation has been spread regarding the Courthouse and retaining the use of the Courthouse on Main Street is not an option because the State has already made up its mind to abandon the existing Courthouse and return it to the County or City. (Exhibit 5). If this is true then why even consult with the public? If the law is going to be so easily dismissed by decision makers then why drag the public through this process at all? Is it just to create the illusion of public process? From your website, “Deference to the judgments and rulings of courts depends upon public confidence in the integrity and independence of judges. The integrity and independence of judges depend in turn upon their acting without fear or favor. Although judges should be independent, they must comply with the law and the provisions of this code. Public confidence in the impartiality of the judiciary is maintained by the adherence of each judge to this responsibility. Conversely, violations of this code diminish public confidence in the judiciary and thereby do injury to the system of government under law. The basic function of an independent, impartial, and honorable judiciary is to maintain the utmost integrity in decision making, and this code should beread and interpreted with that function in mind. The Judicial Council and its staff are committed to maintaining a transparent, consistent, and accountable procurement system that provides Californians the best value initially and over the long-term operational life of court facilities. It would be sad to move forward with the Placerville Courthouse project based on a corrupted foundation. We may not have much confidence in our elected officials, but we retain hope in a judiciary system who adheres to the legal process in order to maintain public confidence in the legal system. We ask you to go back through this process and review the history of this project. If City Councilwomen Wendy Thomas is being truthful, then even the City of Placerville would like to retain the legal use of our existing Courthouse. If this is so then the Court must consider the wishes of the local jurisdiction and its public and honor Alternative 2 in the Draft EIR. If nothing else this Draft EIR needs to be recirculated in a more public and transparent way in order to retain the trust of the people and the integrity of the law. Exhibit 1: Letter from the County of El Dorado. Exhibit 2: Letter from the City of Placerville and cc’ed to Supervisor Jack Sweeney, (the chair at the time was Supervisor Ron Briggs).